For ESPN, it simply doesn’t get bigger than US Open tennis. 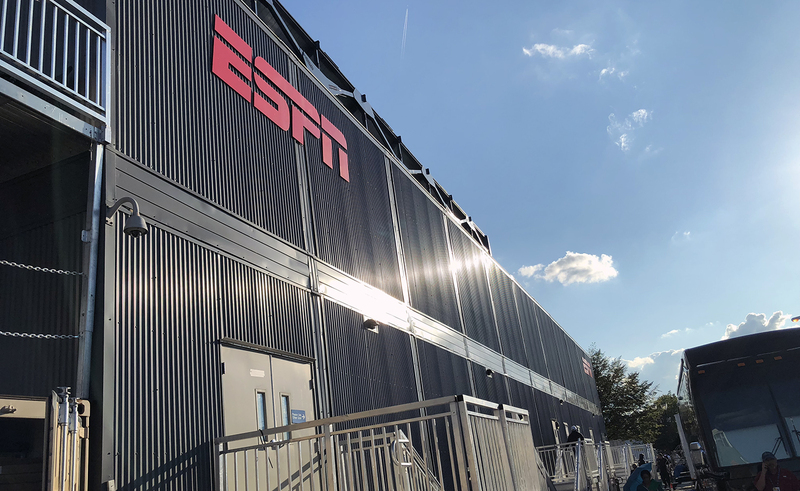 Even with thousands of live events on its annual production calendar, ESPN’s annual pilgrimage to the USTA Billie Jean King National Tennis Center (NTC) stands out as the largest and most complex. 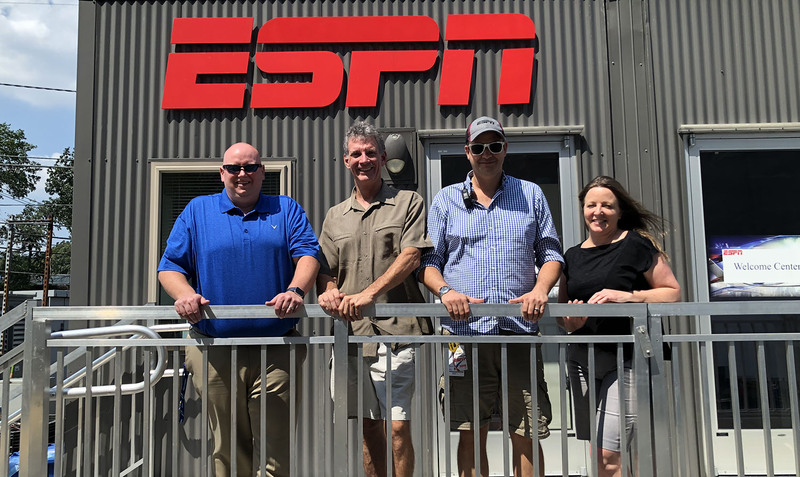 In ESPN’s fourth year as host broadcaster and sole domestic-rights holder —part of an 11-year rights deal — the technical and operations teams continue to evolve production workflows and add elements. Highlights this year include the debut of a Fletcher Tr-ACE/SimplyLive ViBox automated production system covering the nine outer courts, a CineLine two-point aerial system, the US Open debut of the NetCam, and several new behind-the-scenes robotic positions at the NTC. ESPN has once again deployed a throng of cameras at the NTC, totaling 135 in all (including nine Fletcher Tr-ACE systems with four robotic cameras each). New this year is a two-point aerial CineLine system (provided by Picture Factory) running between Armstrong and Court 10, a run of roughly 1,000 ft. The lightweight, RF system is battery-powered, making for easier setup than the two-point systems previously used. The system, which provides bumpers and beauty shots from the South Plaza Fountain area, was set up and live in just over a day. 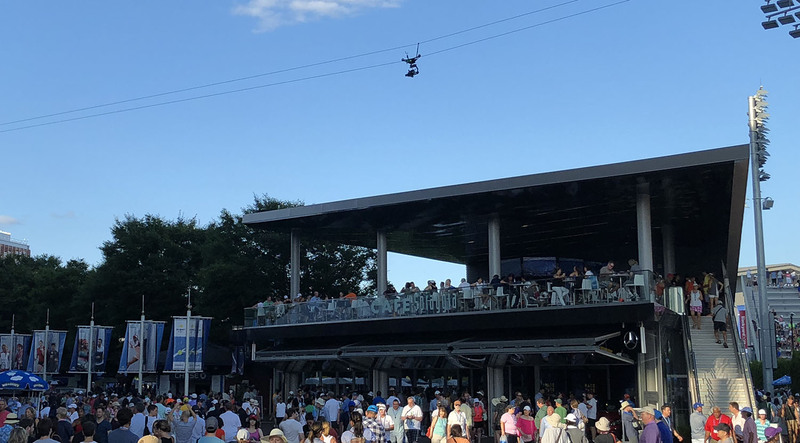 After a successful debut at Wimbledon in June and the Australian Open in January, Telstra Broadcast Services’ NetCam is getting its US Open debut this week. 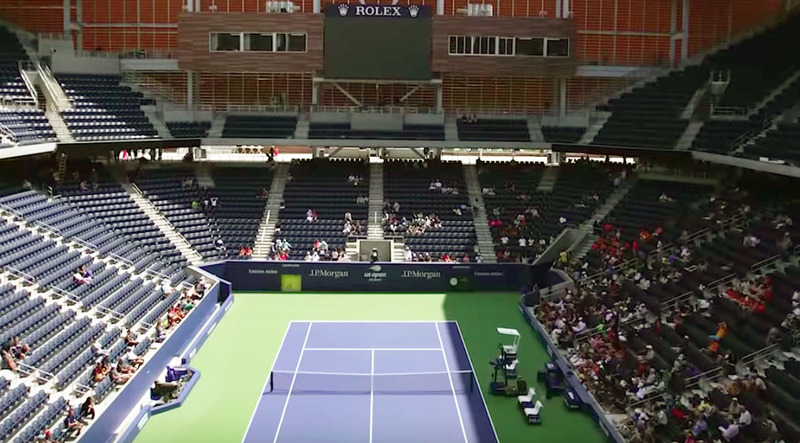 The Globecam POV miniature camera is deployed on each side of the net at Arthur Ashe Stadium, Louis Armstrong Stadium, and the Grandstand for singles matches. The HD 1080i/50 camera system features full-remote camera control and digital pan/framing adjustment, providing viewers with a close-up look at the action on the court. The SpiderCam four-point aerial camera system is back at Ashe this year. In addition to CineLine and NetCam, Intel’s Tru View 360-degree camera system and the SpiderCam four-point aerial system are both back at Ashe. ESPN has also added three robotic camera locations to provide more-intimate looks at two newly constructed player warmup areas and the stringer room, where rackets are strung during the tournament. The debut of the brand-new Louis Armstrong Stadium this week is the culmination of more than two years of planning and construction, a process throughout which ESPN worked closely with the USTA. The debut of the brand-new Louis Armstrong Stadium this week is the culmination of more than two years of planning and construction in which ESPN played a major role with the USTA. In addition to ESPN’s primary set at the South Gate Fountain (seen here), it has its practice court set and a new standup location inside Armstrong. However, a venue is never truly finished. 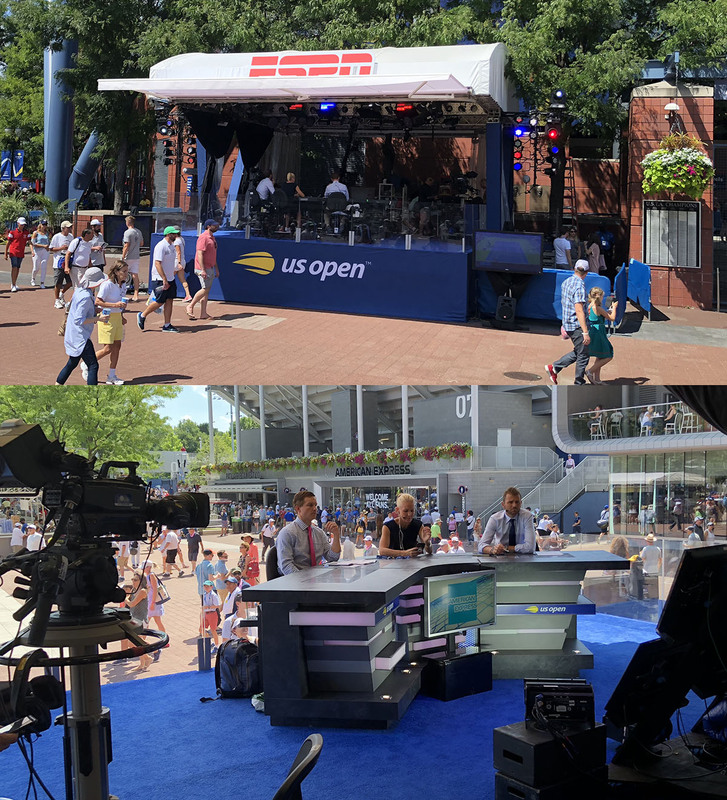 In response to TV-viewer feedback, ESPN worked with the USTA to lower the Camera 1 position from its original location to a lower one overnight on Tuesday. The USTA removed the seats overnight, and ESPN came in at 7:30 a.m. to move the camera. ESPN also mounted a Fletcher robotic camera under the new position to allow an alternative shot. 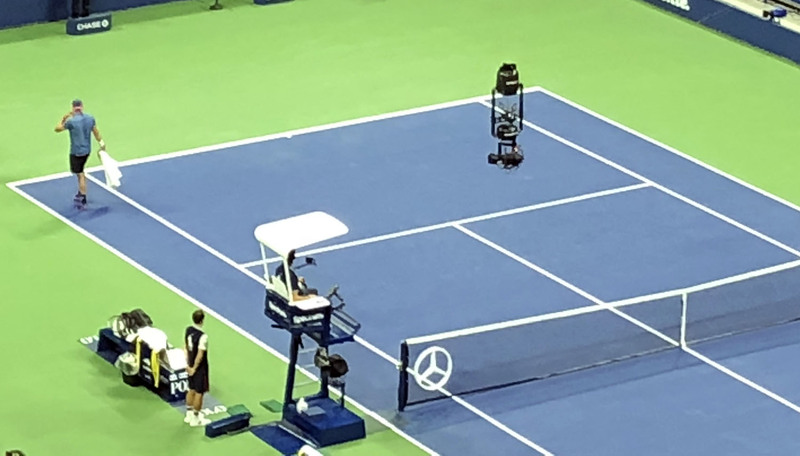 The robotic position provides a better view of the court and is being used as the new Camera 1 position (the USTA reinstalled the removed seats after Thursday night’s matches). ESPN also has a new standup position at Armstrong on the south-side terrace area, which it is using to service all of its on-site live studio shows, including SportsCenter and ESPN International. This has created more flexibility for ESPN to utilize its other two set locations in the South Plaza fountain area and at the practice courts. For the first time, ESPN is covering all 16 courts, thanks to a new automated production system deployed on the nine outer courts. 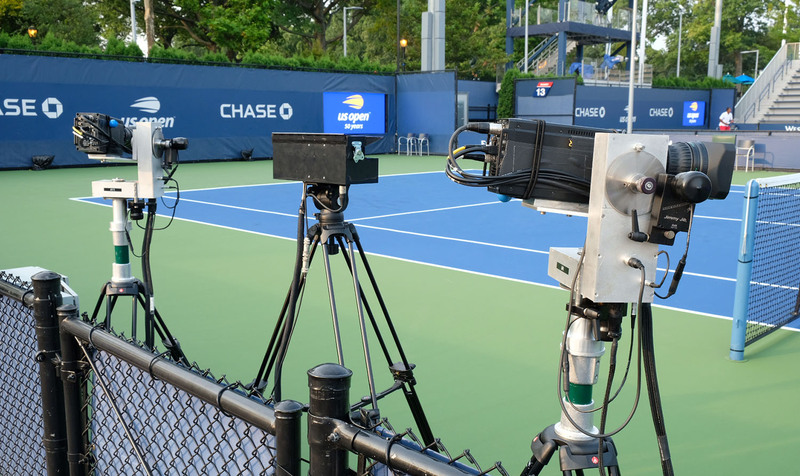 ESPN has deployed the Fletcher Tr-ACE motion-detecting robotic camera system on the nine outer courts at the US Open. Having debuted at Wimbledon in June, Fletcher’s Tr-ACE motion-detecting robotic camera system places four robos on each outer court and relies on SimplyLive’s ViBox for switching and replay and an SMT automated graphics system. With it, one robotic camera operator and one ViBox director/producer is covering the nine courts. CLICK HERE for an in-depth look at the Tr-ACE/ViBox automation system at the Open. The US Open production compound is almost unrecognizable from five years ago, prior to ESPN’s taking over as host broadcaster. What was previously a US Open production featuring a caravan of production trucks five years ago is now ESPN’s NTC broadcast center. What was previously a caravan of production trucks is now two permanent structures housing ESPN’s NTC broadcast center and production/operations offices, plus two ultra-organized stacks of temporary work pods housing the TOC, vendors, international broadcasters, and ESPN’s automated production operation for the outer courts. 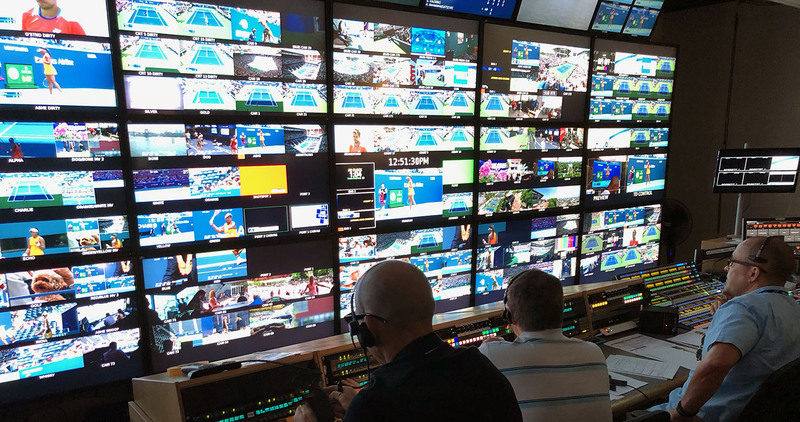 NEP’s NCP8 is on hand for ESPN’s ITV operation (serving AT&T/DirecTV’s US Open Mix Channel), and NEP’s Chromium and Nickel are home to the USTA’s world-feed production. ESPN is tied to its Bristol, CT, headquarters via two diverse 1-GBps fiber circuits, which handle a whopping 37 outbound transmission paths and five inbound, as well as file exchange with Bristol. The two-floor broadcast center, developed in conjunction with Gearhouse Broadcast, is largely the same as in the past three years. The lower level houses the Central Apparatus Room (CAR) with racks and all technical infrastructure; the upper level features seven audio rooms and nine production-control rooms for the seven individual court feeds, the ESPN domestic, and the ESPN International. This year, ingest server and router capacity was increased to accommodate the additional outer-court coverage, and the stats system housed in the domestic control room continues to grow. This year’s operation was made possible by 278 total technical personnel working a combined 30,500+ hours and 3,000+ days. CLICK HERE to check out more of SVG’s “Live From the US Open 2018” coverage.